Mera Peak Climbing is an exhilarant activity that offers the mesmerizing vision of Nepal's eastern soaring Himalayas. It is considered as the tallest trekking peak of Nepal which rocky peak has been recorded at 6,461 meters. 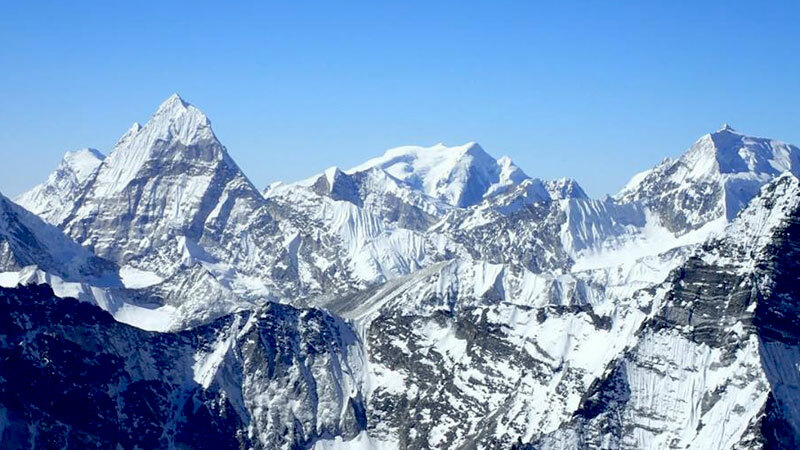 Five miraculous peaks above 8000 meters including Mount Lhotse, Makalu, Kanchenjunga, Cho Oyu, and world's highest peak, Mount Everest can be observed from its summit. Due to the straightforward climbing, Mera Peak Climbing demands physically active and energetic trekkers. Stand at the summit of Mera Peak and get an experience of being at the summit of high mountains cherishing the mind. Mera Peak is located in the east-northern side of Nepal at Solukhumbu District under Sagarmatha National Park. Our climbing tour departs through the capital city, Kathmandu, to Lukla Airport. These 35 minutes of flight endeavor the panoramic views of Nepal's Himalayas. After landing prepare the backpacks and gears then, commence Mera Peak Climbing to the first destination at Puiya. With several days of hiking and proper acclimatization summit the Mera Peak and return back to Kathmandu. Day 01: Fly from Kathmandu to Lukla & Trek to Paiya. Meal: Breakfast, Lunch, and Dinner. Day 02: Trek to Panggom. Attraction: Cross Kari La Pass, Bamboo & Rhododendron Forest, and Dudhkoshi Valley. Day 03: Trek to Ningsow. Attraction: Cross Panggom La Pass, Peseng Kharka, and Nignsow Khola. Day 04: Trek to Chhatra Khola. Attraction: Enter Makalu Barun National Park. Day 05: Trek to Kothe. Attraction: Majang Khola, Hinku Khola, and Sanu Khola. Day 06: Trek to Thaknak. Day 07: Trek to Khare. Attraction: Dig Kharka, views of Charpate Himal, Hinku Nup and Shar Glaciers. Day 08: Climbing Training & Acclimatization. Attraction: Climbing gears training and techniques. Day 09: Trek to Mera High Camp. Attraction: Cross Mera La Pass, views of Makalu, Cho Oyu, Mt. Everest, Nuptse, Lhotse, Baruntse, and Chamlang. Day 10: Mera Peak Summit Day & return to Khare. Attraction: 2 am commence climbing, magnificent views of Sagarmatha, Lhotse, Cho Oyu, Kangchenjunga, Makalu, Chamlang, Nuptse, Baruntse, and much more. Day 12: Return to Kothe. Day 13: Return to Thuli Kharka. Day 14: Return to Lukla. Kathmandu Arrival and transfer to your hotel. Mera Peak Climbing Tour finished here! Kathmandu Domestic Airport Picks up and drop. Kathmandu to Lukla and back Flight Fares with Airport Taxes. Everyday Breakfast, Lunch, and Dinner as per above itinerary. Teahouse/Lodge Accommodation while on Trek. Tent accommodation while on climbing to Mera Peak. An English Speaking Government Licence Holder Climbing Guide. One Porter for Two Climbers. Guide and Porter Salary, Insurance and Accommodation. Assistance in case of Emergency Evacuation. Breakfast, Lunch, and Dinner in Kathmandu. Tips and Gratitudes to Guide and Porters. Use of Wi-Fi, Phone Calls, and Personal Expenses. Wants some modification on Mera Peak Climbing itinerary? contact us to customize it.